viaLibri ~ 世界早まわり競争・バスケットボール・大口太郎・ニコニコエビス. [Sekai hayamawari kyōsō]. [Race Around the World / Basket Ball Game / Big-mouth Tarō / Smiling Ebisu]. 世界早まわり競争・バスケットボール・大口太郎・ニコニコエビス. [Sekai hayamawari kyōsō]. [Race Around the World / Basket Ball Game / Big-mouth Tarō / Smiling Ebisu]. Tokyo. : Dainihon Yūbenkai Kōdansha 大日本雄辯會講談社.. Shōwa 7 (1932).. Colour sugoroku or Japanese game, 5 closed tears (each 2 x 3cm) near from folds, some other light signs of use and occasional light spotting. 61.5 x 92.5cm. This colourful sugoroku game features a race around the world. On the reverse there are three other board games. Issued as a supplement to the 1932 New Year's Day edition of young children's magazine, Yōnen kurabu 幼年倶樂部 (vol.7, no.1) issued on 1 January 1932. The illustrator, Miyao Shigeo 宮尾しげを [1902-82] was a popular manga artist active before the war, but after the war he focused on research of the Edo popular culture. The players on this sugoroku, take the role of pilots. Starting from Japan and the "pilots" take their "planes" on a race landing in China, India, North Africa, Europe, the US, Alaska, the South Pacific and back to Japan. 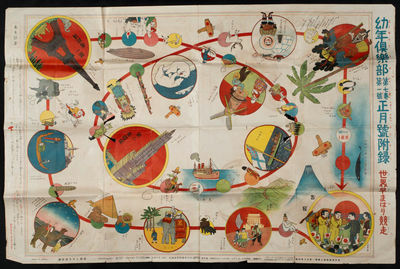 The illustrations include the Sphinx, a camel in the Sahara Desert, a gondola in Venice, the Eiffel Tower, airship Zeppelin, a windmill in Holland, a warship in England, the Empire State Building in New York, Charlie Chaplin, an Inuit girl with an igloo behind her, and a couple who are labelled as coming from the South Pacific though the illustration shows rather a mixture of Pacific cultural images! .